A free toiletry bag is being given away as a gift with purchase by Zegna. Simply purchase $80 worth of Zegna UOMO fragrance and you can add this to your cart when you check out! This free toiletry bag is only limited to one per customer due to availability, so grab it while stock lasts! This promotion was found on Macy’s online retail website; America’s largest and most prominent departmental store! Ermenegildo Zegna have been in the fashion and fragrance industry for decades now and they are one of the most well-known and reputable brands in the industry. This free toiletry bag would be perfect for any lady. With ample space to store your cosmetics and freshener, it is the perfect addition to any lady’s handbag. 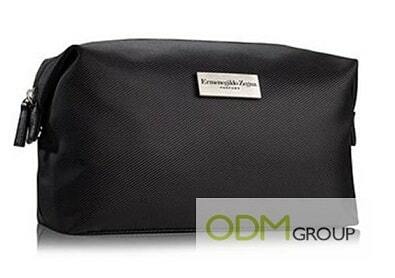 Offering a free toiletry bag is a common promotional gift, especially by cosmetic companies. A complimentary gift can help encourage your customers to make a purchase because they would seem to get more than what they paid for! Furthermore, Zegna is an exclusive high end brand! Therefore, any promotional product that carries their brand name will be perceived to be of higher value; and this includes the free toiletry bag. Offering a free toiletry bag is a great way to market your brand! There is substantial amount of surface area available to brand your logo or message. Anyone that uses the promotional product will definitely see your logo and it will aid in brand recall! Contact us today at ODM to brainstorm and design your very own promotional products! Read other blog links below to find out who else is giving away a free toiletry bag or cosmetic pouch!